The moon circles the earth in 28 days, exactly the same amount of time it takes the moon to rotate around its own axis. This means that the same portion of the moon’s surface is always facing the earth – just take a pair of binoculars and look, the moon always looks the same. Until the US and Soviet space programs in the 1950s and 1960s, humans had stared at the moon for centuries but never seen the far side of the moon. So it happens sometimes that you look from a different angle at a sight you’ve known for a long time and find yourself surprised by what you see. This weekend we took the unimproved “dirt” road from Izcuchaca to the back of the Huaypo lagoon. We’d been to the lagoon before but always from the main road between Cusco and Urubamba, I’d never been to the far end of the lagoon before. 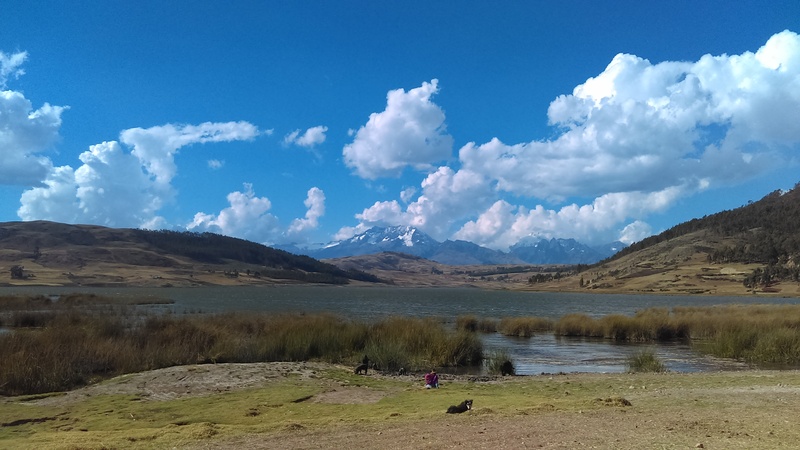 I’ve seen the Urubamba mountain range many times – and it’s always a great view – but never from this particular spot. I’ve been fortunate in my life to have seen many beautiful places and stunning scenery. From the Greek Islands to the Florida Keys, the Yucatan to Niagara Falls. I’ve seen the Greenland Icecap and the Canadian Arctic, flew over a volcano in Iceland and stayed on the shortest street in the world. I’ve seen the Saudi desert and the Amazon jungle, Budapest, Nairobi and London too. I think most of my traveling days are behind me now but that’s OK, to see great sights you don’t have to travel to the 4 corners of the world, all you have to do is ride out to the back side of the lagoon. This entry was tagged Huaypo lagoon, Peru, Urubamba mountain range. Bookmark the permalink. One of our favorite routes between our town of Huarocondo and the Sacred Valley or any of the sites along the hill top (Chinchero, Moray, Salineras de Maras), we always stop here when taking guests on tours that pass the lake and they are always awed by its beauty, and that of the surrounding mountains and valley. I have also been here fishing on several occasions but have yet to actually catch any fish, initially I was told that there was trout in the lake but some of the locals have informed us that there are fish, but they are a small variety. I don’t remember what they called them but I do plan on catching some one of these days, if for no other reason than to just see what they look like. I often times see people out on boats or even sitting on bundles of reeds that they have made a kind of raft from, and occasionally there are people fishing from the shore as well using line wrapped around a can. I know there are fish there as I had gotten some bites on my previous trip, but as I was under the impression at the time that there was trout, the hooks I was using were most likely too big for the small fish that are actually there. You will know when I am successful as I will do a post on my Blog when I do have a chance to actually spend some time there and catch some fish.